Terms create a default set of start and end dates that apply to any course added to that term. Terms can be added manually or created through SIS imports. Once a user is added to a course, terms set default dates for when users have access to courses assigned to that term. Access relates to user participation in published courses. Canvas always includes a default term, which cannot be removed or renamed. View a video about Terms. Not all courses within a term conform to the term dates, as course or section start dates may override the term dates. Course or section overrides may be before or after the start of the term. Only admins can view the Terms page in Canvas. Instructors and students cannot view the Terms page, so please ensure users in your institution are aware of term dates for your institution publicly. In Account Navigation, click the Terms link. 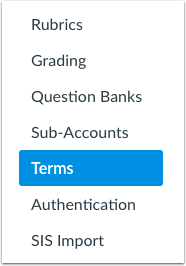 The Terms page displays all terms that have been created in your account. Terms can be created manually or via SIS Import. For each term, you can view all the details created in that term. You can view the name of the term , the term SIS ID (if applicable) , the grading period set associated with the term (if applicable) , and the number of courses within the term . You can also view the term dates  and specific user role access dates . If specific user access dates have been added for the term, you can view the dates within each user role. To edit a term, click the Edit icon . To delete a term, click the Delete icon . Note: You cannot delete a term that contains courses. To add a new term, click the Add New Term link. Previous Topic:How do I apply a macro to a case in the Service Cloud Admin Console? Next Topic:How do I add a new term in an account? Table of Contents > Terms > How do I use the Terms page in an account? Re: Does anyone who uses Peoplesoft SIS have a process that handles alumni?